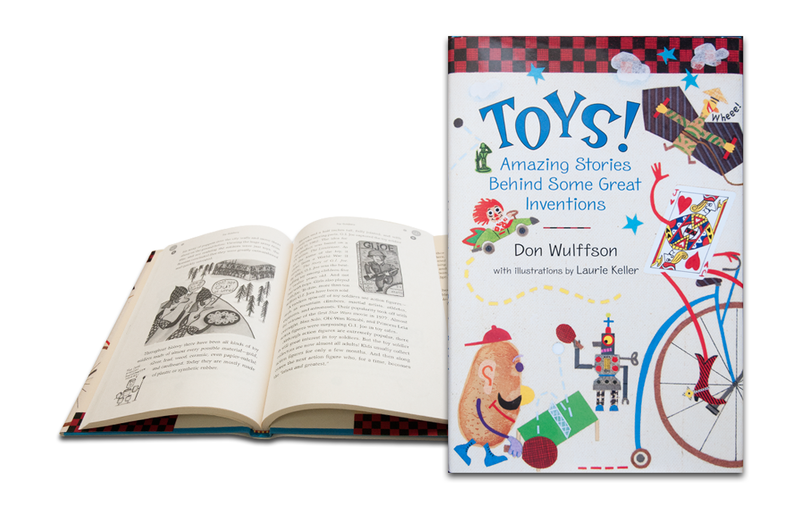 “Behind every toy there is a story”, writes Don Wulffson in the introduction to his book, Toys! Amazing Stories Behind Some Great Inventions. He reinforces this notion over the next 144 pages with a witty and humorous take on more than two-dozen vignettes behind some classic and popular toy inventions. Learn about the macabre use of the see-saw by the Romans, the original use for Play-Doh (spoiler alert: it was used for cleaning wallpaper), and the touching story behind why the Raggedy Ann doll has a red heart on her chest that says, “I Love You”. Educational and fun, the book is written for ages 8-12 – making it a perfect classroom companion for students interested in trivia, history, and the sometimes accidental and quirky thought process used by inventors. Wulffson’s text is deftly complemented via a series of original cartoon illustrations from Laurie Keller that serve to further lighten the tone of each story. A bibliography and list of websites rounds out the book, providing pointers for further exploration and discovery. As someone deeply interested in the history of toys and their inventors, I’m always on the lookout for books from like-minded authors. Despite being targeted at a much younger audience, I enjoyed leafing through Toys! Amazing Stories Behind Some Great Inventions. It has a permanent place on my bookshelf, nestled securely next to another on of my favorites, The Playmakers: Amazing Origins of Timeless Toys by Tim Walsh. Super Play was a magazine dedicated to Nintendo's 16-bit SNES console, games, and culture published from 1992 to 1996.